The house I’m living in is situated at the end of a long country drive. The asphalt road is lined with oak trees and resurrection lilies, which, as their name implies, spring to life for a few weeks each fall to bless the world with their brilliant pink flowers before going dormant for the winter. At the end of the driveway we placed a large red and white sign that says IMAGINE… LIVING FOR TODAY. The word Imagine is fastened to a pendulum that enables it to sway side to side, as the breeze gently sweeps through the oak trees. Not far from our house is a picturesque beach town called Moss Landing. It’s a special place for my family and me because it’s where, after the deaths of my mom and grandma, we scattered their ashes into the sea. Throughout her life my mom used to visit that beach and watch the dolphins play in the surf. On the wall of the home she shared with Kim hung a picture they snapped of their feet relaxing in the sand, framed by the marbled blue ocean and sky behind them. My mom’s feet were anything but perfect – she wore a size 10 double-wide that we liked to tease her about. But the picture had a peacefulness that superseded my mom’s supersized feet … the image shouldn’t have been beautiful, but it was and so is its memory. I like to visit Moss Landing to remember my mom, to put my bare feet on the beach that brought her so much joy and feel the sand tickle the little spaces in between my toes, recalling the way she used to skittle my feet as a child. It was on one of those trips down memory lane that I stumbled upon the sign shop where I bought the Imagine sign. From the road, the yard outside the shop looked like a boneyard for all the props from the miniature golf amusement parks of my childhood — a miniature Eiffel Tower, a French gazebo, a guillotine, a set of giant lips. At the entrance hung a sign with the words Imagine Atelier because, I assumed, “sign shop,” was just too plain to describe what went on in this place. Once inside, I discovered a mix between the oddity of the Addam’s Family home and the wonder of Fantasia … a delivery room for creativity, a place where dreams are imagined and given life through the hands of an artist. The owner, Glen, greeted us. He looked to be around 80, tall and gray with the presence and strength of a man who’s lived a bit and plans on living a good bit more. His eyes were filled with the naughty sparkle of a rebellious connoisseur who plays life by his own rules. Glen spends his days amongst his creations with his wife at his side — like a boy and his sweetheart who never left the junior high art fair. They hang out at the Atelier, loving each other as he manifests the contents of his heart in wood, steel, and whatever other materials he can muster up. The day I arrived, Christy was with me. I like to think we’re a bit like Glen and his wife — dancing cheek to cheek through life to the tune of a love song only we can hear. We all hit it off and chatted for a while, two sets of sweethearts, kindred spirits, imagining what could be. Christy and I asked Glen to build us a sign to commemorate the occasion … and our life. That’s how Imagine was born. That sign, swaying in the wind among the oak trees at my home, now greets me as I return from walks in the woods and trips to the local market. The word Imagine forms an arc as it waves at me, side to side over the stationary words in the sign’s center: Living For Today. It’s a metaphor of sorts for a life of mindful living in which we allow our imaginations to run wild while staying firmly grounded in the living of each day. Imagine. Most of the sensations we hold dear in life require that we first imagine them. As Muhammad Ali said, “The man who has no imagination has no wings.” We need imagination to see beyond our pain and challenges and envision the something more we refer to as happiness. In the worst of times it’s our ability to imagine better days that keeps us going. We close our eyes and find imagination shining a light on the happiness hidden in the dark. Compassion is also born from imagination. Our ability to see past labels is what enables us to connect to the feelings of the people around us. Imagination is the spark in our heart that transforms our judgment of a horrible boss, a homeless young person, or an illegal immigrant into the realization that they too are people, with feelings just like ours. It’s the sense that this could be me … this could be my child … this could be my loved one. Falling in love is another area graced by imagination. We can meet someone new and within days (or sometimes minutes) we’re able to visualize a life together: a wedding, a home, children, a dog. We might comment to our friends, “I can really see myself with her …” Even the act of being present amidst life’s many distractions is facilitated by imagination. We may think of imagination as something outside the present but, like my red and white sign, presence and imagination work together. Presence is the zoom lens and imagination the bird’s eye view. Through presence we find the beauty and purpose of today, while imagination is the vehicle by which we discover the potential and possibility that propels us ahead. We need them both; and yet, so often we find we have neither. In the worst of times it’s our ability to imagine better days that keeps us going. Caught up in the constant spinning of the hamster wheel of our busy lives, we get stuck in the abyss. Lost and fragmented, lacking a vision for the future, we grab hold and cling to the rigid rules of society. We do what we’re told to do, we behave as we’re taught is good, we follow the prescribed programs for success … all the while lacking the imagination to live as we truly desire and deserve to. In a world of stagnant imagination we have difficulty looking forward, so we keep our eyes in the rear view mirror. We romanticize the past and demonize the progress we have trouble seeing. We oppress and oppose because we lack a vision or dream for the future. In some ways the opposite of imagination might be stagnant tradition — those rigid, dogmatic views that bind us like rusted shackles we’re unable to cut loose. Not that all ritual is bad; in fact, when healthy it can be a starting point, a foundation for the fresh ideas of the time. Tradition fueled by imagination becomes an invitation to a new beginning, not the beginning of the end. Lack of imagination is one of the reasons that caring for ourselves is so difficult. We’ve been taught not to daydream or —in the words of many an elementary school teacher — don’t just sit there and do nothing. Yet meditation, with all its benefits, is in fact just sitting there … doing nothing. Our parents scold us don’t be picky, and yet healthy eating and living requires that we pick and choose carefully. The devil’s playground, the pastor warns us, is an idle mind, so we fill every moment with entertainment and distraction to avoid any chance of boredom. But the devil is also found in the details, and when we curb boredom and contemplation, we also eliminate the space to imagine … a life of creativity, compassion, and love. When we curb boredom and contemplation, we also eliminate the space to imagine. Like so many of life’s treasures, imagination is a skill. To experience it abundantly we must practice. 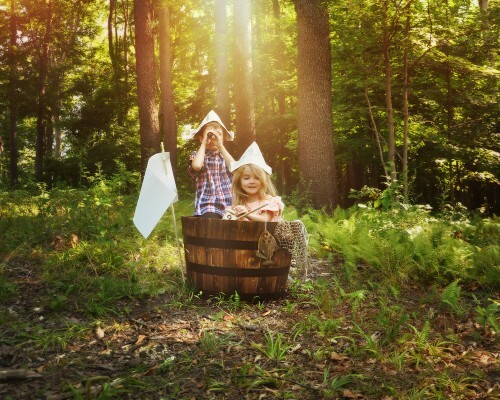 The practice of imagination is what we learned to do as children … in the times before some well meaning adults intent on teaching us about the real world told us that Santa Claus was actually mom and dad with an AMEX paying a cashier at Toys R Us to fill up shopping bags with our gifts. On the playground of life we emptied the contents of our hearts and minds with the tall tales of our imaginations. We told fantastic stories, painted pictures of fairies and goblins, we sang nonsensical songs and did the chicken dance. Life was full of wonder. We believed in ourselves and in each other. Like Glen and his Atelier, we weren’t restrained by life. Instead we embraced it and, in return, it embraced our hopes and dreams. Perhaps, now, the greatest act of imagination is simply the ability to imagine enough space in your life to allow yourself to practice the skill of imagining. This week I invite you to let your imagination run wild. Imagine unbridled happiness, compassion, and love even as you ground yourself in the reality of today. Write a poem. Paint a picture. Take a photo on your iPhone and frame it on your wall. Sing a song. Dance a little. Dream a lot. Explore the creativity deep inside and enjoy the artistry of life as you allow your heart to express itself without the restrictions of what you should or ought to do. Imagine … just imagine, and see what you find. Love your post on Imagine! Your style of writing is fresh and inviting. I will look forward to your next one! Keep up the good work Jason! Knowing you both so well in person, it’s such a pleasure to hear your conversations on DEEP DIVE and feel that you’re right here with me. Your authenticity rings so true. This is how you speak with me and Dan, and to yourselves — I hope others hear what I know — that this is you two, as real as it gets. No rehearsed script. Just two loving persons talking and giggling and sharing. Precious! That is an excellent idea!! I was in Paris last week, and now I’m back at work wishing I was there…..I’ll just imagine myself there! !